Arrival in Bari / Brindisi airport and transfer to Lecce. In the late afternoon you will meet our staff members who will brief you on your trip (in Italian, German, French or English). Then we recommend a short walking tour in the old town of Lecce, the ´Florence of the South´. You will fall in love with its Spanish baroque style and its Roman ruins. Transfer by train from Lecce to Giurdignano. Walking through old meadows in the middle of beautiful olive groves, you will reach Giurdignano where we will visit the megalithic garden with its Bronze Age dolmen and menhirs. Then you’ll head to Casamassella where you will visit the ancient looms brought back into production by the ‘Le Costantine’ Foundation. Walking through the Idro Valley, you will discover an ancient Byzantine crypt. At the end of the trail you will arrive in Otranto. Here you will have time to discover the pearl of the Adriatic: the Byzantine frescoes of the church of San Pietro, the walk on the ramparts overlooking the sea, the cathedral with its medieval ‘tree of life’ mosaic floor. Today you will explore the natural wonders around the Idruntina town: the bay of the Orte, the lighthouse of Punta Palascia, and the bauxite quarry. Starting from the Otranto Castle you will go down to the port through the Porta a Mare. Once you reach the main pier, you immediately enter the coastal area heading to the Snake Tower, easily reachable through wide paths. There are imposing cliffs framed by the presence of caverns decorated with stalactites and stalagmites. You will reach the Lighthouse of Punta Palascia, famous for being the easternmost point of Italy and the place where the Ionian Sea meets the Adriatic. After a long stretch along the coast you will leave the paved road and a pleasant trail will take us to the Bauxite Quarry (from which aluminum was once extracted but which is now a stunning lake) whose decisive colors present a unique landscape. From the quarry you will head back to Otranto. You will get settled into your accommodation and then, when ready, you will start walking towards the Ciolo path that goes down to the canal; a path leads you stretching between “pajare”, dry walls and a varied flora including bushes of euphorbia arborea and with a stunning view of the sea. Once you arrive at the bridge of Ciolo, here begins the footpath of the Cipolliane that winds through walls and terraces and a constantly exciting sea view. The vegetation is a mixture of huge ‘fichi d’india’ (prickly pears), imposing agaves and capers. You will see the stones polished by time, air and salt, which form the unusual but always harmonious shapes of the walls constructed to protect the small fields from the strength of the sea and the wind. We will visit the caves of the Cipolliane, an interesting complex of caves where you can admire stalactites and columns, tunnels and fossils, and birds colonies. Back on the trail you can continue to Novaglie (where you can take a break) or go back to the Ciolo bridge if you’d like to swim. The canal goes up under high cliffs and ancient caves, and after passing a reproduction of the Madonna di Leuca, you will reach the square from which you can continue on to Gagliano. Overnight accommodation in Gagliano del Capo. This day is dedicated to the discovery of the small treasures of the Cape of Leuca and the beautiful city of Gallipoli. Firstly you will cross ancient paths that connect the small villages. The first stop is Patù with its ´Centopietre´, an enigmatic monument created with a funerary function and then used as a religious chapel (traces of Byzantine frescoes are visible). In Giuliano you will visit the ancient “San Pietro curch” (XII century) and its amazing castle. 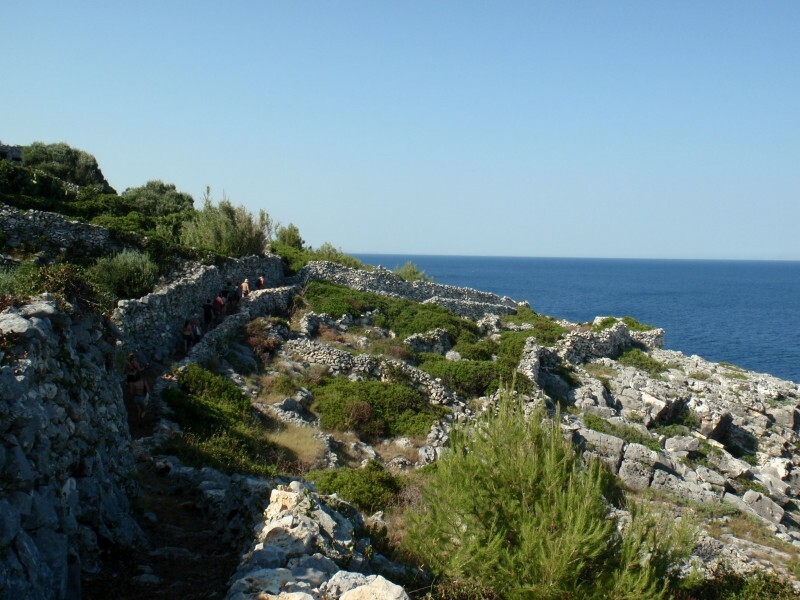 In Barbarano you will visit the sanctuary of Leuca Piccola and its hypogeum, an ancient destination for pilgrims and a stop for the faithful people of Leuca. From here you will walk on to reach the station of Ruggiano-Salve to take the train towards Gallipoli. Porto Selvaggio is one of the most striking coastal areas of Salento, which became a regional natural park in 2006: within the area there are numerous karstic caves with the remains of communities dating back to the Palaeolithic era. From the old town of Nardò you will walk through ancient cuttings between dry stone walls and olive groves and at the base of the slope of the Alto promontory where, on the upper plateau, you’ll find the Tower of Santa Maria dell´Alto whose construction dates back to 1568. After having enjoyed the wonderful view that unfolds below the ‘Belvedere’, you will move down to the bay of Porto Selvaggio and from there, following a beautiful path between cliff and the famous Mediterranean ‘macchia’ (scrub) with Aleppo pines, olivastri, lentisco and acacia saligna, you will reach the ‘Grotta del Cavallo’ (an archeological site which one can only view from the outside) known to be a Neanderthal settlement. From there you will go back to the promontory and, passing along scenic trails, we will reach the Uluzzo tower. The itinerary continues towards the Nova Masseria and from there, continuing along small trails, you will return to the town of Nardò. This day is dedicated to a visit to two of the most important old towns in the province of Lecce. You will visit the town wandering through the streets of the center until you reach the magnificent Basilica of St. Catherine of Alexandria where you can admire the many frescoes of Giotto´s influence. Optional cooking class: If you wish, you can stop instead in Galatone where a cookery class will introduce you to some of Salento’s traditional cuisine. (Train to Galatone and 5 km walking to the cooking class villa). Train to Lecce (1 hour) and guided tour of the city of Lecce. Road book with cultural information and tips about the route. 24 hr assistance (local company).